How public opinion turned decisively against the Egyptian dictator. Cairo, Egypt—The measures taken by the Egyptian regime over the last three days are not just targeting demonstrators; they are affecting everyone. Ahead of Friday’s post-prayers protest, the Egyptian government cut off every form of instant communication—namely, the Internet and cell phone service. The goal, it seemed, was not just to prevent people from organizing demonstrations or sharing their experiences with the outside world, but also to create an atmosphere of chaos and uncertainty. Without the Internet and cell phones, there would be no way of knowing whether danger lurked in a nearby neighborhood, no way of knowing whether loved ones had returned home safely. Meanwhile, Mubarak’s riot police blanketed the city with tear gas. It rose up into apartment buildings, where it choked people who had stayed inside. It fell into subway stations, where it caused people to vomit uncontrollably onto the tracks just as they were heading home. It lingered along the highways, where people stopped traffic to beg passing cars for sanctuary. There was simply no avoiding the regime’s excesses. And those excesses seem to have had an effect on Egyptians. When a variety of opposition movements first called for nationwide demonstrations on January 25, they had rather limited demands: the resignation of Interior Minister Habib Ibrahim El Adly; new parliamentary elections; raising the minimum wage to 1,200 Egyptian pounds per month. And most demonstrators’ aims were even more nebulous: Many had never participated in anything political before, and they seemed simply to be expressing generalized political and economic frustration. In the aftermath of the Tunisian revolution, they wanted to do “something,” even if that meant just showing up. None of this was mutually exclusive with Hosni Mubarak remaining president. Besides, his reign was expected to end soon, given his age and reportedly poor health. And so, when protestors returned on Saturday, they had changed their tune. 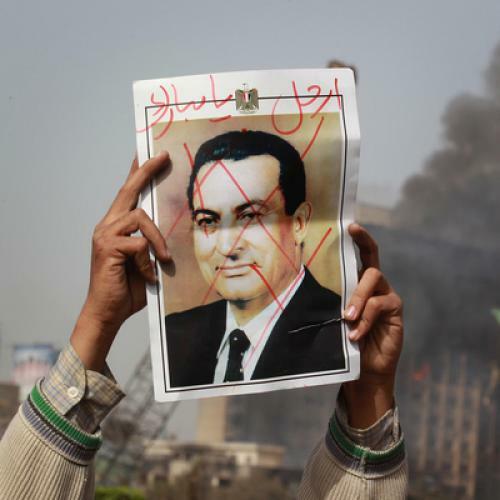 They were no longer directing their anger at the government writ large, but instead chanted “al shaab yureed isqat al rais”—“the people want the fall of the president.” They handed out head shots of Mubarak with an “X” across his face. They held posters proclaiming that Saudi Arabia should welcome him, much as it had welcomed former Tunisian dictator Zine El Abidine Ben Ali two weeks ago. At times, these shows of anti-Mubarak sentiment became hysterically theatrical, such as when a man ran around in front of the Egyptian museum with only one shoe on, using the other shoe to slap Mubarak’s photo in front of any photographer he could find. The gleefulness of it all was, perhaps, more appropriate for a holiday than for a revolution. But it was yet another indication that old, brutally enforced taboo against insulting the president in public no longer existed. Indeed, there is an independent spirit in Cairo at the moment. Rather than submit to the false choice between tyranny and chaos, Egyptians have taken security into their own hands. They have organized community watch groups to patrol their neighborhoods, and have kept their lights on to ensure proper lighting for their streets. Far from being afraid, they are, maybe for the first time ever, quite certain that they can do without Mubarak. Eric Trager is a Ph.D. candidate in political science at the University of Pennsylvania. He was a 2006-2007 Fulbright fellow in Cairo, Egypt.